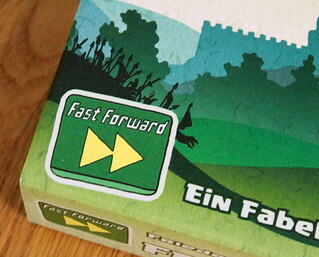 Fabled Fruit was successful enough – and Friedemann had enough fun making it – to spawn a series of games with the same system, now dubbed the Fast Forward system: Fear (German: Furcht), Fortress (Festung) and Flee (Flucht). (German editions by 2F-Spiele, English by Stronghold Games.) In fact, the Fast Forward games even go one step further than Fabled Fruit did: they don’t give you any rules to read before you start playing. All you do is put the big stack of cards on the table and start drawing cards. When you get to a card with rules you read it out loud and put it on the table for everyone to see. The rules on that card are in effect from that moment on. The system puts us reviewers in a bit of a pickle. We obviously want to avoid spoiling the experience for you by giving anything away, but technically everything beyond the title of the game could be considered a spoiler. Even the basic rules are on the cards you draw during the game, with more advanced rules added later. So tread with care, gentle reader, the following paragraphs will contain spoilers for the first one or two games of Fortress you will play. If you want to avoid those and start the game unspoiled, skip ahead to the next heading where we tell you if you should try it. 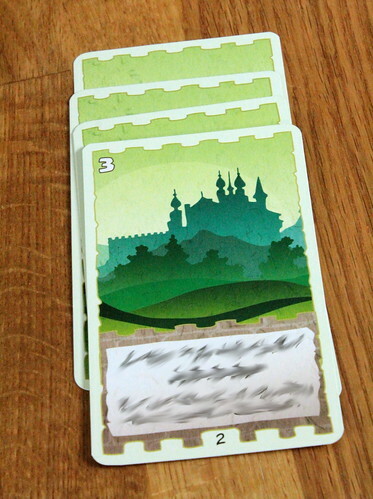 The first cards you draw in Fortress will be number cards you won’t know what to do with. You’ll just have them until someone draws the next rules cards and the objective of the game: the Fortress. Once drawn the Fortress starts out in the center of the table. From now on you have two options on your turn. Either you draw a card to your hand, or you attempt to conquer the Fortress. Whoever has the Fortress when the third hourglass is drawn from the stack wins the game. Unsurprisingly, conquering the Fortress is where the number cards come into play. To attack the Fortress take any number of cards with the same value from your hand. Before the first conqueror takes the Fortress it’s undefended, so any attackers are able to capture it. Take the Fortress card for yourself and place your attackers under it without letting the other players see them. Those cards are now the Fortress’s defenders. To take the Fortress from you another player has to attack it with his own cards. If the total value of his attackers, calculated from the cards’ value and the number of cards played, is higher than your defenders’ value, he conquers the Fortress. His attackers become the new defenders and he takes one of your defenders to his hand. The rest return to yours. If the attackers lose the defending player wins one hand card from the attacker. However, he has to reveal the defending cards in return, so now there is one player who knows the strength of the garrison. Those are all the rules for the first game. 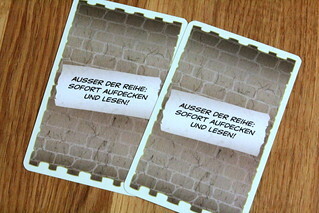 When it’s over, right after the third hourglass, you find the card explaining how to set up the next game: all cards defending the Fortress for the winner are removed from the game and returned to the box. All other hand cards are shuffled together with the next five cards from the draw pile. Those cards make up the game pile for the next game, all other cards are set aside, to be added in sets of five every time you start a new game. Why are those cards under the Fortress? The more games you play the more rules and special cards you find. Even so, Fortress never becomes overly complex and a single game never takes more than about ten to fifteen minutes, even when most of the cards are in play. You can play through the whole stack of cards in something like two hours. We’re certain about that number because once we started playing no one wanted to stop. But given the nature of the game it is reasonable to ask: and then what? Once you played through the pile, what do you do next? Well, you have two options. You can just keep playing, the bottom card has rules how to rotate cards in and out of the game pile so every game is different. Or you can sort the cards again and start over. It’s just as much fun the second time around, even though you know what’s coming. Even mixing players that know the game already with players that don’t is not a problem at all. Thanks to shuffling the cards and taking out some cards after every game, Fortress won’t develop the same way twice. There is a small advantage from knowing what cards might come up, but it’s easily balanced by the luck of the draw and a few good bluffs. Both those things, luck and bluffing, are part of the game. Draw bad cards and there’s not much you can do. But use a mediocre hand well and you have a chance to win. For a game as quick as this one the balance between luck and tactics is just right. Fortress is a great game to play when you’re not in the mood to listen to a long explanation. Just jump in and go. And it’s not used up after two hours of playing, either. Even knowing all the cards Fortress is still a game you’ll enjoy.